We’re a group of mountain loving people who want to bring the mountain closer to you. We design experiences that make that possible for all people, all levels and all physical fitness. We love exploring and we believe in biking as a support for cultural, gastronomic and agro tourism as well. On our tours you’ll always get a chance to meet the Shepherd high in the mountain, visit historical sites, meet the locals, taste the moonshine and marvel in how many uses Romanian cuisine has for lard. Lucian is up the mountain pretty much all year long. On his feet, on his bike, on his skis or on his motocross bike. 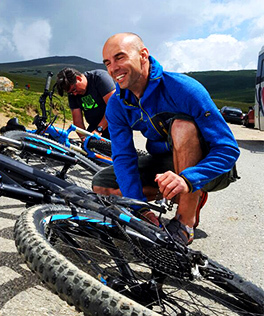 He is a certified Romanian Mountain Guide, certified MIAS Mountainbike Group Leader and the first guy to say ‘let’s go ride that ridge over there and see where it goes’. Chief explorer with a contagious energy.